This is just a year of firsts for me. Have you ever heard of mini advent calendar cards because I sure haven’t! They are basically just advent calendars sized down to be easily given as gifts and holiday cards in person or through the mail. Each of the cards that I found is currently priced at less than five dollars. Unlike some Xmas card advent calendars that have treats on the inside, these contain special images for each day of advent allowing your cards to keep on giving. They are also blank on the inside so you can include a custom message for your loved ones. I chose these greeting card advent calendars because they have a variety of different images to choose from to help match how you best celebrate the holidays. 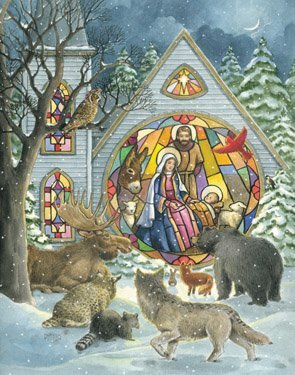 The first one has a very beautiful stained glass image of the Virgin Mary and baby Jesus surrounded by animals. It is classic and lovely; something that my mother would have loved to not only give but to receive as a holiday card. See more card calendar options here! 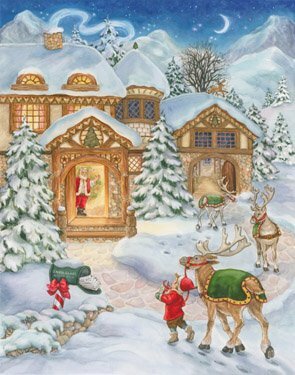 The other two mini advent holiday cards have views containing elves and reindeer or elves and Santa Clause. 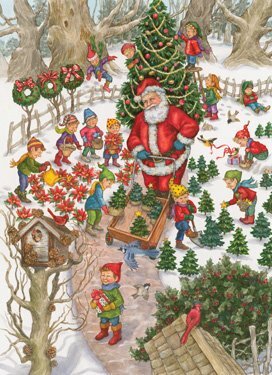 My personal favorite is the Santa Claus one because I love the mini Christmas tree forest that is being picked by the army of working elves. Not to mention they are wearing some of the cutest Christmas hats. You can keep them in a drawer to give out as special cards whenever the occasion arises this holiday season or you can buy a variety of them and give them out to all of your closest friends and family. As with any of the picture or non chocolate advent calendars, it is important to send them out early enough for your recipient to fully enjoy opening up a slot each day. Honestly the great thing about the treat calendars is that you can cheat and open those all late to eat the candy or take advantage of the treats (though probably still a good idea to get those early as well.) I have never gotten a mini advent calendar card and I bet there is a good chance that your friends have not either. So take advantage of that and surprise everyone this year with an interactive Christmas card.